What to expect at a performance? What’s a True Story show like? During the performance, 6-12 audience members take the risk to tell important moments from their lives on the theme. True Story actors and a musician instantly capture the essence of each story through drama, movement, and song. The experience is almost always profound, leaving the audience with fresh insights, a stronger sense of community — and sometimes a good laugh. Take part in a fun introduction to Playback Theater with True Story troupe members. Through fun and connective exercises sharpen your ability to listen and empathize – essential skills for everyday. Learn ways to reflect the heart of someone’s experience through movement and sound. All levels of experience welcome! 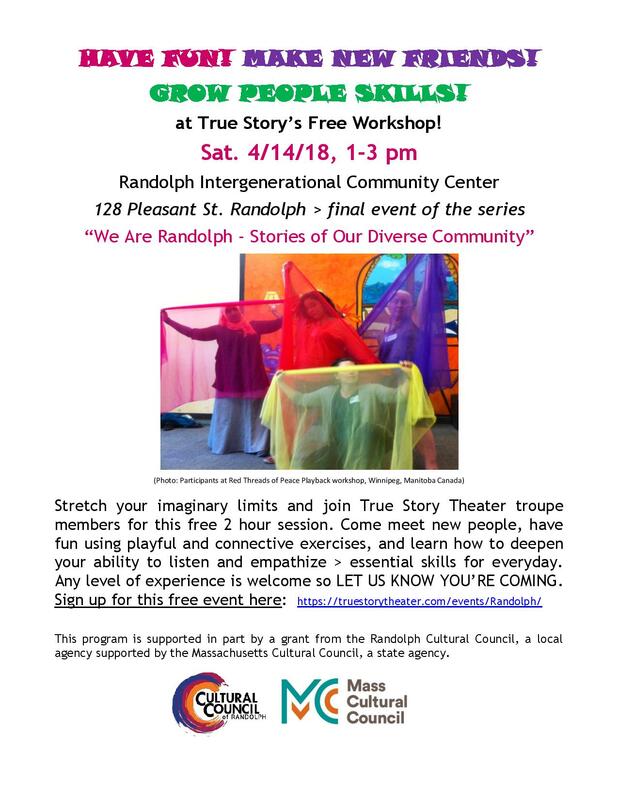 This program is supported in part by a grant from Randolph Cultural Council, a local agency which is supported by the Massachusetts Cultural Council, a state agency.